Established in 2009 by the Centre for Offshore Foundation Systems and the School of Civil and Resource Engineering, the award-wining O-Tube Program is focused on a unique facility, the only one of its kind in the world. The Program pioneers improvements in engineering designs and promotes safety, reduces human and environmental risks and optimizes infrastructure investment. 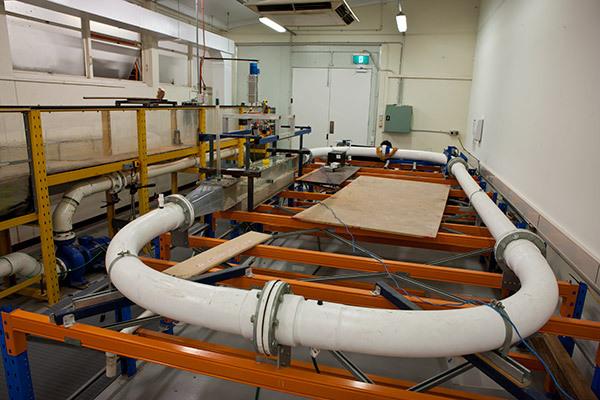 Designed and built by UWA’s in house technical team led by Liang Cheng and David White, the large and mini O-Tubes are oval recirculating flumes through which water is rapidly circulated, simulating extreme underwater wave and current conditions. Together, the large and mini O-Tubes are revolutionizing research on pipeline stability design and sediment transport. The large O-Tube can create cyclonic conditions in a controlled experimental environment, demonstrating how seabed sediment, pipelines, other infrastructure and flora interact with the marine environment. It functions by forcing 60 tonnes of water at up to 3 m/s through the 1.5m square working section with a 16m long bed of natural seabed soil. This allows researchers to track the impact of wave and current loading on underwater infrastructure. 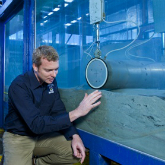 The mini O-Tube, at 1:5 scale of the large O-Tube, allows for rapid turnaround on smaller scale experiments and has been instrumental in studying in-situ soil erosion, a new research stream made possible by funding from the Australian Research Council and oil and gas industry partners. The key motivation for the development of the O-Tube facilities is the severe cost of stabilizing the pipelines that connect Australia’s offshore gas fields to shore. The cost of the concrete weight coating or anchoring systems on these pipelines is a significant part of the capital expenditure associated with the projects. Using the physical observations from the O-Tube simulations, we are aiming to develop new analyses for the processes that control pipeline stability by using a multi-disciplinary approach that combines hydraulics, geotechnics and pipeline engineering. To date, our research findings have already yielded technical outcomes with a benefit-to-cost ratio greater than 10:1 for industry partners. O-tube tests have been conducted for clients Atteris, Advanced Geomechanics, Arup, BHP Billiton, BP, Chevron, Woodside, JP Kenny and Apache. The UWA O-Tube facility has continued to receive industry accolades by winning 3 awards, including the Innovation and Development category of the 2012 WA Engineering Excellence Awards and the Subsea Energy Australia Innovation and Technology award. The team also received a 3-year ARC Discovery Grant to tackle the fundamentals of seabed scour near pipelines.